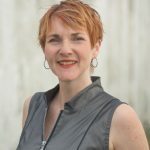 Author Katherine Dewar reflects on the Boxing Day floods 2015 and what it meant for her feminist climate change thriller, Ruby and the Blue Sky, which is set in Leeds and describes such a flood. Debut novels are more usually found on shelves than in glass cases but sometimes the unexpected happens. In December 2015, while Leeds people affected by the Boxing Day flood waded through damage and clean up, I sat here, at my desk, on the far side of the planet, to confront its implications for my manuscript. I was at the final editing stage of my debut novel, Ruby and the Blue Sky, which is set in Leeds, in the near future of 2021. I was expecting to tame semi-colons and line-breaks, following the ruthless guidance of my proof readers, but the Boxing Day events took me by surprise. In a scene in the novel, Ruby, the protagonist, watches the Aire from Crown Point Bridge and remembers the river flooding. I had invented the flood she recalled based on historical accounts of the 1866 flood, discovered through Secret Leeds. It seemed reasonable, given climate change expectations, it could happen again. On December 26th 2015, it did. It was my strangest moment in writing Ruby’s Leeds. From my new home here in Aotearoa New Zealand, I first fretted about the families and local shops in the city I’d called home for nine years. The news footage of familiar streets, awash, showed the strife and stress and then the grit of people mucking in and getting on. I let the reality settle and then, in the early days of last January, I spent a day online in Leeds. Revisiting the news reports seemed too distant so I also immersed myself in first-hand accounts. I followed all Danielle Thornton’s Twitter posts from December 26th and 27th, sharing her experience of being trapped in a building by the rising water and I traipsed through the wet streets on YouTube, to get the size and smell of it right. The flood fills only a few paragraphs of the novel but shows how vulnerable the places and people we love are to climate change. I wanted to get it right. Disturbingly, when I compared the factual accounts to my manuscript, I found I had written the flood almost exactly as it had happened, even down to the relatively worse impact on Carlisle and York. I moved the extent of the flood by a block, swapping Briggate for Sovereign Street, and added some festive ‘lolling amongst presents and pudding’, turning a purely fictional scene into a historical one. Seeing something I had written as fiction become fact was disconcerting and new to me, but isn’t unusual in writing cli-fi. Kim Stanley Robinson details a number of his fictional climate events that later unfolded off the page in his foreword to the Green Earth omnibus. 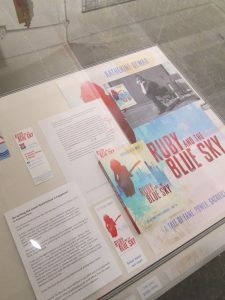 I published Ruby and the Blue Sky in July 2016, complete with the amended flood scene, and was grateful to be able to visit Leeds for the launch. Setting my novel in the city has bound me closer to it. Those bonds have been further tightened by the curator of the Flood Response exhibition kindly including Ruby and the Blue Sky among other community responses to the flood. The exhibition at Leeds Industrial Museum at Armley Mills opened in December, to mark the anniversary of the flood, with my novel, literally, displayed in a glass case. 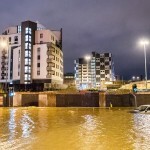 The Boxing Day 2015 flood was the worst ever recorded in Leeds. Three thousand homes were affected at the time, it took many local shops months to reopen and part of the Industrial Museum remains closed today. The Aire sparkled in sunlight when I visited last summer and has flowed politely through Leeds so far this winter but, with 2016 on track to have been the warmest year ever, we don’t need to be novelists to predict more floods. If you can make it, a visit to Flood Response would be a fitting way to mark the events of last year and to reflect on what’s ahead, if we don’t act now. The exhibition is open every day. 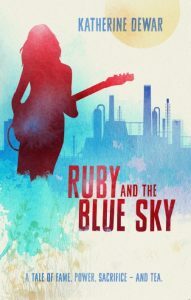 Ruby and The Blue Sky is Katherine Dewar’s debut novel, a feminist climate change thriller, set in Leeds. The paperback is in-stock at Leeds’ independent bookseller, RadishWeb. You can borrow a paperback or an e-book from Leeds City Library. 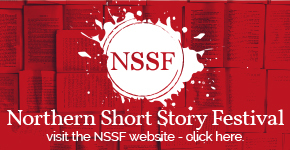 You can buy the e-book or paperback from most online bookshops, worldwide. You can like Ruby and the Blue Sky on Facebook, follow @KatherineDewar on Twitter, register for email updates from Katherine or read more at www.KatherineDewar.net. Katherine was raised in North Yorkshire and has a BA in Political Studies from the University of Leeds. She lived, worked and fell in love in the city before moving to New Zealand where she now lives, in a house by the sea, with her darling.